If you are one of the lucky few webOS users to have both a Pre3 and a TouchPad (and have paired them together) and stream audio over Bluetooth, you have probably noticed that your audio stops or stutters during playback at times. On prior webOS phones this could happen if your device was trying to connect to a Wi-Fi network while playing the audio (and this still happens on the Pre3), but the audio would never stutter otherwise. The cause of this appears to be the result of the Pre3 trying to auto-connect via Bluetooth to the TouchPad after a text message is received, which interferes with the audio that was streaming over the same Bluetooth radio. There are two workaround to "fix" this problem. The simple fix is to keep the TouchPad in range at all times. Since it's the actual attempt to auto-connect the Pre3 with the TouchPad that causes the stutter, once the connection is made there is no issue. Of course, it's not always feasible to carry around the TouchPad with you, especially in the car! Instead, you can adjust the Bluetooth connection preferences on the Pre3 to prevent it from auto-connecting with the TouchPad. 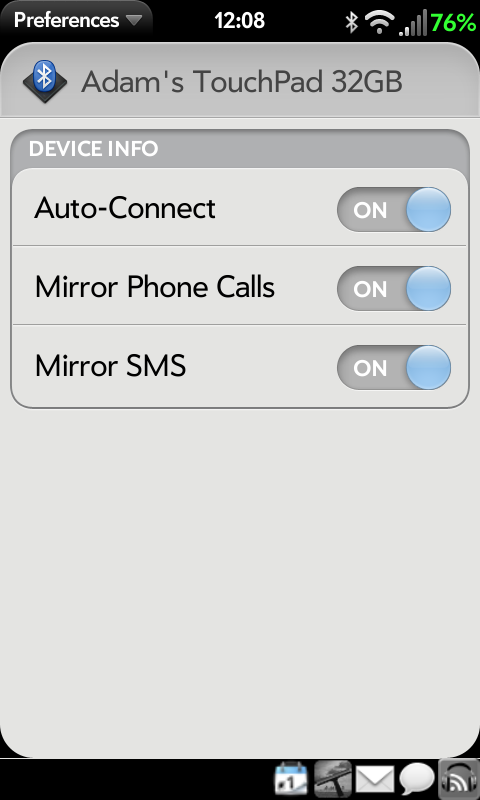 Just open up the Bluetooth Preferences and tap the button next to the Touchpad and turn off "Auto-connect". However, don't forget to turn it back on once you are done with the audio if you want the Pre3 to reconnect back with the TouchPad later on. You may still hear a brief pause in the audio when a text message is received, but it will be for a fraction of a second instead of 5-10 seconds.